How Booking.com and Tripadvisor hotel reviews work? Vi trovate su: Home / How Booking.com and Tripadvisor reviews work? User-generated reviews are getting everyday more and more important when a traveller is selecting a hotel for his next trip. Two of most famous websites including hotel reviews are Booking.com and Tripadvisor. However, both websites are using a different logic to rank and notes accommodations. After making a quick reminder on how both websites classified hotels, we will compare results obtained by 5 star hotels in Barcelona, London, Paris and Rome, then, we’ll analyse if hotel rankings are consistent between those 2 websites for 78 five star hotels in London of over 45 bedrooms. Reviews on Booking.com can only be written by travelers who stayed in a property. Booking is emailing its clients once they checked-out with a link inviting them to review and provide their feedback about their stay whereas Tripadvisor allows anyone with an account to post a review on whatever hotels. To counter this weakness, Tripadvisor has implemented some safeguards. One of them is based on their proprietary algorithm called “The popularity index” that determines ranking based on the quantity, quality and age of reviews for any given property. Older reviews carry less weight than more recent ones. As a consequence, a ranking increase (or decrease) can almost be immediate. 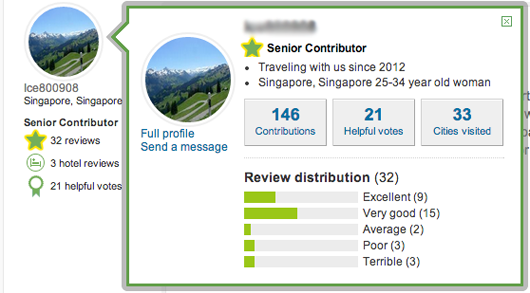 The weight of a review also depend of level obtained by a TripAdvisor registered user (star color) as well as if a review is judge “helpful” by other TripAdvisor’s users. TripAdvisor use a general note but also some notes for each characteristic of an hotel like value, location, sleep quality, room, cleanliness and service. A 5 points review could contains some 3, 4 points on some of those characteristics. It’s important to specify that the answer of the manager of an hotel to his client (called by tripadvisor “the management response”), is not considered for ranking even if those answers are really important for users and for future reviews. Tripadvisor allows Hoteliers to answer reviews via their own profile whether on Booking.com, hotels use to only be able to send an email to reviewers. However, since mid-March 2014, hoteliers can also respond reviews on this site following sending of a letter of information from Booking to french hotels. Concerning the total number of reviews, Booking.com indicate number of review posted by its users during 14 past months whether TripAdvisor never delete reviews apart if the hotel ask it (for example following a refurbishment or a property change of ownership). Therefore, on TripAdvisor, some reviews can date back to more than 10 years ago. Looking at this data, we can be surprise to notice that in London, users are posting more than twice the number of reviews than in Rome on Booking.com and on Tripadvisor if we compare the total number of reviews by room available in a destination. On Booking.com, London’s and Barcelona’s five star hotels are getting a slightly better note than hotels in Paris and Rome. Access here our Full pdf report with notes and number of reviews on Booking and Tripadvisor. At first sight, rankings of hotels on Booking and Tripadvisor are relatively similar. 11% of five star hotels in London have their ranking varying of over 25% between Booking.com and Tripadvisor . In other term 9 out of 78 hotels have a ranking varying of over 20 positions . 8 five star hotels in London are ranked in Top 10 worst hotels on both websites. 92% of 5 star hotels in London have a note between 9,3 and 8,2 on Booking.com.